This was my first stay at a Radisson Blu branded property. I had visited one of the Radisson Blu hotels in Helsinki few years back when it was branded as Radisson SAS. Club Carlson have been running quite a few attractive promotions lately, and I decided to check few of their properties in the coming months to see how they match to what competitors are offering. The price of the hotel is way too high considering what it has to offer. If you have a friend or relative working at a Carlson affiliated property, you probably should looking to use their friends and family rate that brings the price of the hotel to reasonable. That’s what I did. It is on the western side of the Denarau island/peninsula next to the Sheraton and Westin complex. On the other side is a Wyndham timeshare property. It is about 20 minute ride from the airport that should cost around 25 FJD using one of the official taxis. The check in desk is immediately right when you get in to the hotel. There is a separate check out desk. They had first some trouble finding my reservation as I had done it only couple of hours earlier when I was at the Hilton’s property. Further complicating the check in was my request for 2PM check out. Apparently the regular check in time is 11AM that would not have worked on my case. This request required the lady to make a phone call to the front desk/rooms controller, but the late check out request was granted. This was the weakest link. Overall the room was rather unremarkable. The phone didn’t work well and there was something wrong with the radio/clock as well. The hotel didn’t have wireless and the internet cord was way too short. I really have to start bringing with me a wireless router and/or a long Ethernet cable. I used to carry these, but after not needing them for few months stopped the practice. The hotel was able to solve the wireless issue by bringing a wireless router that is normally used at their ballroom/conference area. There is really no beach in the Denarau area where you would like to spend any time. The pools at this hotel were absolutely fantastic, however. I believe that these pools are the strongest selling point of this property. There are two/three pools that are connected via waterways. 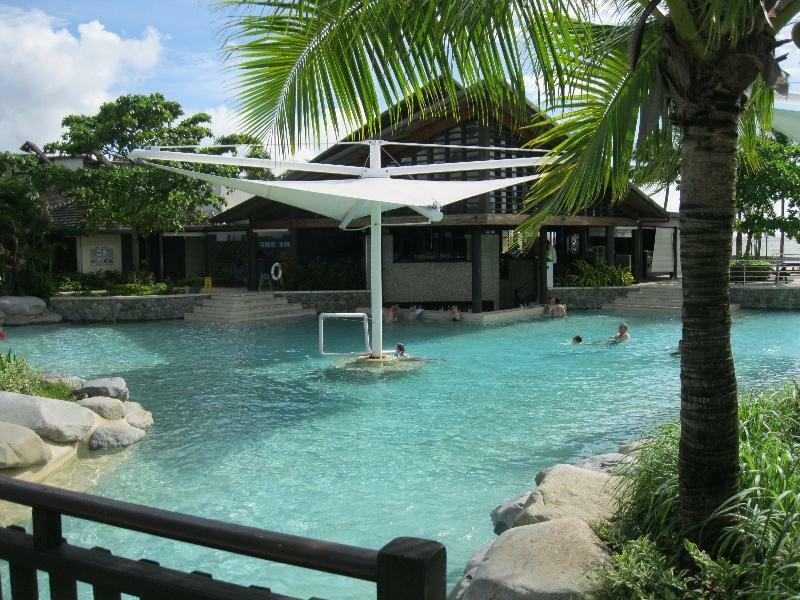 There is the usual pool bar where you can drink your day away while still being in the water. It was rather small but had the usual equipment. The thread mill was broken and they didn’t have any sweat towels available. I let the front desk know. They need to update the equipment in not so distant future. After you have spent some time in Fiji you accept a service that is slow, but mostly done with a smile, although not always. This property is fine, but doesn’t live up to its being the first on Tripadvisor (as of February 2012) for Denarau. You should come here if you really like spend most of your time by the pool and the actual room/suite is not that important.